Add Sweet Patriotic Touches to Independence Day with 4th of July Candy! Make your Independence Day even sweeter with patriotic treats from Blair Candy! We carry a selection of candies in red, white, and blue wrappers, along with candy that’s great for creating a festive buffet or goodie bags at your 4th of July party. Add a star-spangled touch to your Independence Day barbecue with a candy buffet displaying red, white, and blue Sixlets, lollipops, M&M’s, and gumballs. Then, as a thank you to your guests, create goodie bags with fruit punch, blue raspberry, and cherry limeade Frooties along with mints in American Flag wrappers. At the end of the day, pack a picnic basket before you head out to see the fireworks, and include some packs of America Mix Skittles to snack on while watching the show! 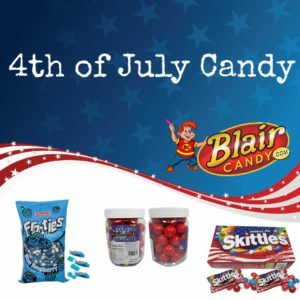 Blair Candy offers lots of ways for you to add sweet patriotic details to your day with 4th of July candy, so get creative with showing your USA pride!